FLOWER OF SALT is a natural product from the region of Kampot in Cambodia. This delicate salt is hand harvested on the surface of the sea-water ponds of the Kampot saltworks according to a traditional method. It has a very mild salt flavor that reveals the taste of the food with finesse. Sprinkled on cold dishes, its delicate crisp reveals the delicate taste of fresh organic tomato or an excellent foie gras. The harvesting of Fleur de Sel took place for centuries in the famous French salines of Guérande in Brittany. FARMLINK has implemented the same exacting techniques and methodology in Kampot from 2012 onward with great success. All operations are manual, from the cultivation to the final cleaning. 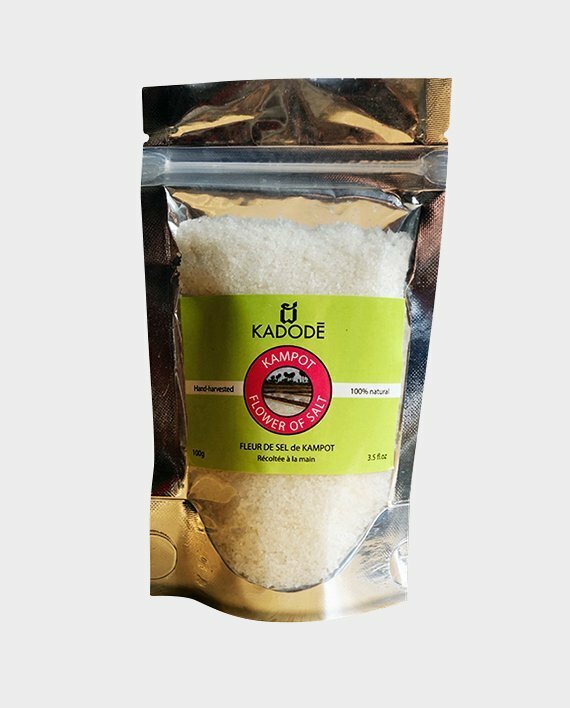 The quality of KADODE Kampot Fleur de Sel is beyond our wildest expectations. There are only a few Salt production sites in the world have the perfect weather conditions needed to produce a great Fleur de Sel. The extraction of sea salt is based on a natural process of concentration of salt by sea salt evaporation until its final crystallisation. The salines of Kampot are located in the south of the Kingdom of Cambodia, on the Gulf of Thailand. The salines of Kampot provide most of Cambodia’s own salt consumption. The sea water is drained through many canals and ponds until fully cleared of all unwanted residues. It finally arrives at the last ponds of the salines with minimal water depth. This is where the harvesting of salt and the fine Fleur de Sel can finally take place. As the water evaporates, the salt concentration rises from 25mg per litre to 300mg per litre. Such concentration guarantees that no bacteria can survive, nor any form of life. The Fleur de Sel forms at the surface of the basin for a short while. It can only be harvested manually by the sea workers using a special rake, due to its fragile crystalline texture. For every kilo of Fleur de Sel, 30 kg of regular sea salt is produced.